The broadbills are a small family with only 15 species and eight genera. Their taxonomic position was somewhat of a mystery for most of the twentieth century, but recent phylo-genetic studies using morphological and molecular (DNA sequencing) data have shown that the broadbills form a monophyletic group with the pittas (Pittidae) and asities (Philepittidae). Together, these three families comprise the Old World suboscines, a group that shares a tracheobronchial syrinx, or vocal apparatus. Richard Prum suggests that the asities are the sister group of the African green broadbill (Pseudocalyptomena graueri). His Eurylaimidae thus consists of five subfamilies: Smithornithinae, Calyptomenanae, Eury-laiminae, Pseudocalyptomenanae, and the Philepittinae. The eight genera in this family are quite distinct and do not appear to be closely related. They may be the last survivors of a once much more diverse group that was slowly replaced by a radiation of oscine songbirds. The origin of the broadbills is still a matter of speculation. Suboscines probably evolved on Gondwana, so it seems reasonable to hypothesize an African origin (giving rise to the ancestors of Smithornis) following the break up with South America. 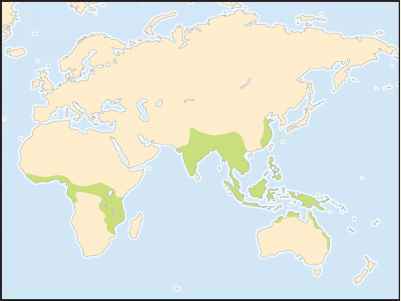 Broadbills then diversified by spreading into Asia (Calyptomena, Eurylaimus, Corydon, Serilo-phus) and then back to Africa (Pseudocalyptomena and asities).